Welcome to your Cosmic Family Reunion! Join us for this powerful Virtual Art Exhibit of activating, galactic artwork that represents the loving, cosmic connections that are truly family to so many of us! Cosmic artists from around the world are coming together to share their art and stories to inspire and empower you in your own Cosmic Family Reunion. One new piece of art each week. Over a dozen artists from around the world. Get it all in your inbox for free! Whether you are just meeting your cosmic family for the first time, or have already been exploring this connection for a while, the artwork in this Exhibit can assist you in deepening that connection and opening even more to your own cosmic nature. I want this Exhibit to feel like home, truly like a family reunion, and to empower you to connect and communicate for yourself. These art pieces can serve as powerful tools to assist you in your connecting and remembering! But don’t just take my word for it. Come on in and experience it for yourself! It’s free, and you can unsubscribe at any time. What is the story of this piece? 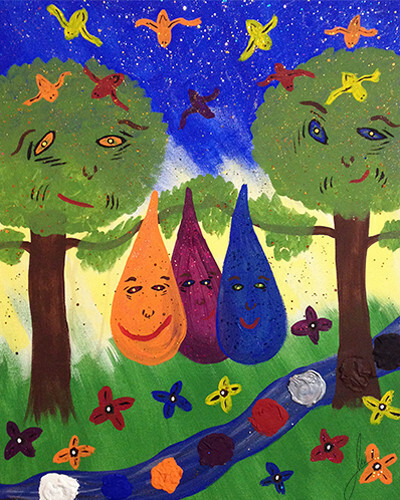 This painting was created as a “cosmic play date” with two of my hybrid children. Ethan and Mikhael are Yahyel-Earth human hybrids and were some of the first members of my cosmic family that I consciously connected with. I created this cosmic playdate as a way to connect more deeply with them. I painted with the intention to connect and paint with them, and this painting was the result. What do you feel is the core message or transmission this piece has to share? It’s a fun family vibe to me! Even the trees and the birds feel like they are part of the adventure, and the whole landscape feels alive and whimsical. This painting reminds me that my cosmic family loves to have FUN, that they live in a state of joy and delight, and that nurturing this state within my own life is the best way to connect with them. Especially the hybrid kids!